There will be a ceremony of laying a wreath at the Dulwich Hamlet Football Club on Saturday 9th November. As the team and staff will be traveling to an away match at Bognor Regis, the ceremony will take place at 10am sharp. You are most welcome to attend. We initially intended to cover Tom Rose's career with the Hamlet but it soon became clear that there was much more to him than the tale of his sporting achievements. During the research we uncovered long forgotten details of his life away from the sports field, the tale of a successful local politician and patriotic soldier. Tom’s family show a high level of geographical mobility. His father, Alfred, was born in Dorking in 1847, his mother Elizabeth Jane three years later in Banbury. By the age of 14 Alfred was a Pupil Teacher lodging in Raunds, though Tom’s parents began married life in Banbury where Alfred Robert was born about 1869. The 1871 census sees the family, including five-month-old Thomas Harry, lodging at West Newlyn in Cornwall though the latter had been born in Lowestoft. Alfred Snr. was listed in the census as a Fish Merchant. The family soon returned to Lowestoft where Edith was born about 1872. A final move saw them off to Clee, in the shadow of Grimsby docks where Kate, about 1877, and Bessie, about 1879, were born before Tom himself arrived, probably in November 1880. Tom is listed as 4 months old in the April 1881 census, which saw the family living at 215 Cleethorpes Road, Clee with servant Elizabeth Graham. A final child, Frederick, arrived about 1882. The family fortunes took a downturn in mid 1888 when Alfred Snr. died aged just 41. The 1891 census seem to reflect the new circumstances. There is no servant and the family have moved to 52 Stirling Street, Clee with Elizabeth described as a Fish Merchant and Alfred Jnr. as a Fish Merchant Manager. Alfred Jnr. had moved out by the 1901 census, having married Jane. They lived in Cleethorpes with their three children, the eldest of which was another Alfred. Home for the rest of the Rose clan was now 8 Park Street, Clee, with Thomas, a self employed Fish Merchant, and young Frederick, a Fish Labourer. Kate was a Drapers Assistant, but the rest had no listed means of support. Tom, now aged 20, was a college student. He appears to have been a bright lad. It was unusual for someone from his background to study to that age, by then most of his contemporaries were earning their living from the docks. It was an advantage he was to put to good use. Tom appears to have moved to London on leaving college to take up a teaching post and was soon featuring for Dulwich Hamlet’s first team at both football and cricket . His football career covered the era when Dulwich established themselves as the dominant force locally, and joined the prestigious Isthmian League. He faded from the picture just as Dulwich began to emerge onto the national scene. Dulwich began the 1903/04 season, Tom’s first with the club and their second at Freeman’s Ground, with a 1-1 draw at Honor Oak. It appears Tom did not feature. He did play the next week, a 3-0 win at Chesham Town , making arguably the most impressive debut in the Hamlet’s history. The South London Press commented; “Rose, the new centre, scored the three points, so must be said to have made a favourable debut” . This was the start of a fine scoring run for Tom; he certainly scored in four of the next seven matches and may well have scored in the other three. Dulwich won two of those matches comprehensively, 5-0 v Upton Park and were defeating The Coldstream Guards 4-1 at half time, the match report did not list a final score. The third was a 2-2 draw with local rivals Townley Park. Contemporary reports do not name the Hamlet scorers in these matches but in those days it was rare for a non forward to score from open play, making it distinctly possible that Tom scored in his first 8 Dulwich games. No wonder The South London Press commented “the forwards are settling in nicely, and Rose is certainly a catch” . Tom drew a blank when Dulwich lost 0-3 to Wingfield House , the first time in their history Dulwich had conceded as many as three goals at home to a London team without scoring themselves. It was fortunate Tom had started so well, as the big pre-season signing for the front line, G. Grenville Brown (a Devon and Cornwall representative) had failed to live up to expectations and was quickly dropped. as Southern Suburban League Champions, fittingly given that Pa Wilson had founded the league. The Hamlet celebrated with an end of season tour to the Kent coast; Tom was in the touring party. Hamlet won both matches, defeating Ramsgate St George’s 2-1 and Margate 7-0. 1904/05 started badly for the Hamlet, with a series of defeats, Tom, though, was playing well. He featured less as a goal scorer from the right wing, but was regularly cited by the newspapers as responsible for setting up goals for his team-mates. 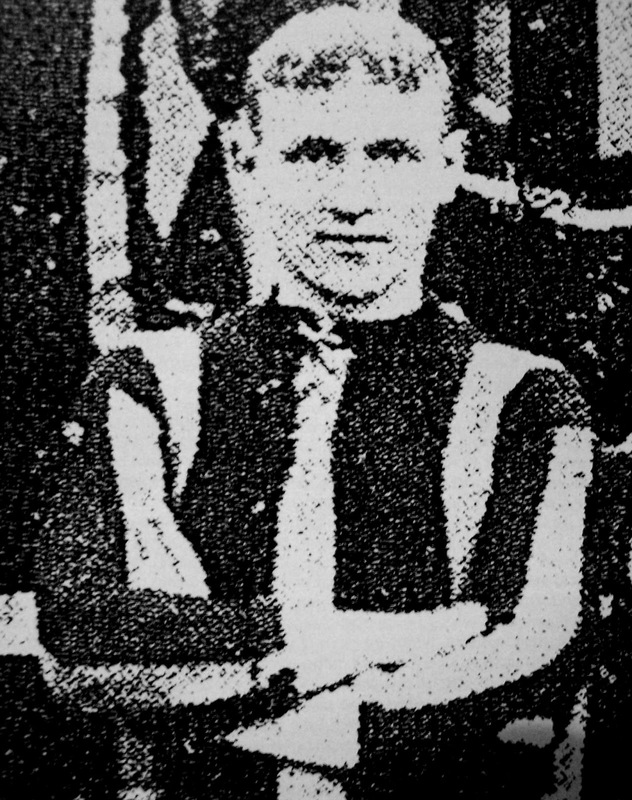 After an 8-0 victory against Weybridge The South London Press commented “Rose was quite unstoppable at outside right and getting in beautiful centres.” His position briefly came under threat from teenage sensation Albert Russell, however Tom raised his game and Albert was eventually to establish himself on the left wing the following season. Probably the best description we have of Tom as a footballer comes from The South London Press on 21st January 1905 after a 4-2 win over Woking, in which Tom scored, “…Rose, undoubtedly the best forward on the field. His taking of passes and his lightening runs on the wings stamp him at once as a capable and dangerous forward.” Surrey F.A agreed as Tom made his debut for them on February 22nd in a 2-2 draw v Hertfordshire at Croydon. This was some honour; the failure of Surrey to select players from the ‘border clubs’ had been a sore point with Dulwich for a while. One notable league match occurred on 25th March with Dulwich defeating Bromley 3-1 through a hat-trick of penalties by Gooseman, a recent signing from Civil Service FC. The South London Press lamented that Bromley, who previously had a reputation as the roughest team in South London, appeared to be reverting back to old ways. The season again saw silverware in the Dulwich cabinet, a surprise 3-1 win over Redhill in the Surrey Senior Cup at Croydon was watched by nearly 5000, ensuring the cup stayed in Dulwich for the third successive year after Townley Park’s two wins. Tom personally had a poor game. The final forced the postponement of the Easter Tour though the club still played Margate, club records suggest they also played Ramsgate St George’s though no results are known. Tom and the other teachers in the team stayed in Kent longer than the rest of the squad could. Tom also appears in a couple of Dulwich Hamlet Cricket Club line-ups that summer. DHCC appear to have been much less publicity minded than the football club as their results only seem to made the paper if the opposition submitted them. The two matches we have a record of were less than successful for Tom; he scored just 2 & 0. 1905/06 was the best season of Tom’s Dulwich career. He was a first team regular and played a leading role as Dulwich reached three cup finals. The season began with news that a major internal spilt had seen Townley Park lose many of their players. Their leading forwards, brothers Fred, Sid and Harold Buck, all signed for the Hamlet, effectively securing Dulwich’s position as the top team locally. With the Buck brothers taking over the three central striking roles Dulwich suddenly had a surfeit of strikers and early games saw various combinations of Tom Rose, Stan Hann, Arthur Newman and Albert Russell on the wings before the selectors settled on Albert Russell on the left and Tom on the right. Tom regularly received good reviews though the SLP was none too impressed with him in the 1-0 win over Casuals in the London Senior Cup Semi Final:- “Tom Rose sprinted away to his heart’s content but sprinting is not football and instead of rushing down the field he should use his judgement as to where his other men are before centering. He was guilty of this weakness on three occasions.” Tom’s impressive form saw him back in the Surrey team on 4th November; again facing Hertfordshire at Croydon in a match Surrey won 6-1. He began 1906 on tour with Surrey, playing v Suffolk at Ipswich on 3rd January and Norfolk at Great Yarmouth the following day. Both matches ended 1-1 . Dulwich’s plethora of late season cup matches caused fixture congestion, forcing them to scratch from the Southern Suburban League when well placed to win it. The glorious finale to the season began with a 5-0 Surrey Charity Shield victory over Guildford at Croydon’s Brigstock Road ground, with Tom singled out for praise in the match report. That match saw the Hamlet rattle up their 100th goal of the season. Subsequently, the London Senior Cup Final was lost 3-0 to New Crusaders in front of 8000 at Herne Hill whilst the Surrey Senior Cup was retained, amidst controversy. The initial match was a 0-0 draw with Croydon. Due to fixture congestion Surrey F.A scheduled the replay for the Crystal Palace grounds directly after the 1906 F.A. Cup Final between Newcastle United and Everton. Dulwich won 3-1 however the result was overturned after Croydon protested that the large crowd had encroached onto the pitch. Dulwich won 2-1 at the third attempt but the players boycotted the presentation and the entire club party boycotted the post match concert arranged by Surrey F.A in protest at the decision to order a third match. It may or may not be co-incidental that Tom never represented Surrey again; indeed it appears probable that no Dulwich players were selected by Surrey the following season. Ramsgate St George’s and Margate again provided opposition in an Easter Tour; once again the results are unknown. Tom also features in four DHCC scores listed over the summer of 1906, in view of the fact he is sometimes mentioned as a cricketer and not a footballer it seems reasonable to assume that his batting average of 8.5 is not a true reflection of his talents. Truth be told it seems that, that year at least, DHCC were not very good; they were skittled out for 41 in one match. They were taken seriously within the club though; Pa Wilson was their Treasurer and an occasional umpire. 1906/07 saw a new 250 seater stand opened in a 1-1 draw v Clapton in September, gates by now were generally around 2000 with 2500 considered a good gate. Interestingly the referee temporarily suspended a match v Nunhead at Champion Hill in December to remonstrate with the crowd over their use of foul language whilst an F.A. Amateur Cup game was switched from King’s Lynn to Dulwich after the former’s ground was closed for a month, presumably due to crowd trouble. Hamlet won the match 3-1 with goals from Tom, Harold and Sid Buck. The Buck brothers were scoring goals for fun that season; in March they scored all the goals in a 6-0 home win v Old Malvernians, the 1902 F.A Amateur Cup winners (Fred 2, Sid 3 & Harold 1). Tom also took part in the Easter Tour of the Channel Islands. He and Harold Buck grabbed a brace each in the opening 4-0 win v Guernsey; however Tom was injured in the second match and had to sit out the rest of the tour. The tour probably didn’t help relations with Surrey F.A; Dulwich withdrew from the Surrey Senior Cup as the scheduled date for the final clashed with the tour. Silverware came in the form of the Surrey Junior Cup and Southern Suburban League won by the reserves, and the Surrey Minor Cup, won by Dulwich St Barnabas. The Reserves were also runners up in the Crossley Charity Cup. 1907/08 started badly for Tom with two new wingers, Brennan and Armstrong, being praised by The South London Press as the club began their first Isthmian League campaign. The other main change to the team was that Fred Buck began to fade out of first team football, being replaced by his younger brother Septimus ‘Seppy’ Buck. Tom won his personal battle though and soon ousted Armstrong from the team. His knowledge of the Buck’s game was still proving useful, on 24th January the SLP said, after a 5-1 London Cup victory over Shepherd’s Bush, (Sid Buck 3, Harold Buck 2) “The combined play of the 3 Bucks was a pleasure to witness, especially as they were in perfect touch with Rose and Jarrett.” Just a week later after a 2-2 Surrey Senior Cup draw at home to Woking the paper commented on “some capital work by Rose, who beat two or three of his opponents and then sent the ball across to Harold Buck who found the net with a capital drive.” Dulwich lost the replay, attended by 121 Hamlet fans, 3-2 a.e.t. The Bucks and Tom didn’t always work quite so effectively, on occasions the same paper berated the Bucks for starving their wingers of the ball. The season saw Dulwich reach their second London Senior Cup Final but they lost 1-0 to London Caledonians in front of 6000 at Herne Hill. At the end of the season, Tom took part in the first foreign Easter Tour, visiting The Netherlands. The Hamlet drew 2-2 at The Hague and defeated Haarlem and Dordrecht 3-5 and 2-4 respectively. The season also witnessed a new ground record gate, 3500 watched a 3-2 win over Nunhead on Boxing Day. The season ended with the Reserves once again runners up in the Crossley Charity Cup. Dulwich were unusually busy with trial games in the run up to 1908/09 and it soon became clear why; the Buck brothers had all left the club. They founded a nomadic Amateur Football Association registered team called Surrey Wanderers, who featured six of the seven Buck brothers in their first ever line up. It’s hard to over-state the importance of the Buck brothers to Dulwich in their short spell with the club. On the pitch they dominated in a manner that arguably had not been seen before or witnessed subsequently. To put it into perspective, we have identified the scorers of 53 goals from the 1906/07 season – Dulwich scored more but contemporary reports often don’t name all the scorers. Fred scored 16, Harold 14 and Sid 11. Tom was the fourth highest scorer with 7, Radley got 2, Rhodes, Knight and Hardy 1 each. The club faced a tough job replacing the Bucks, but did it with the signing of Ernie Vasey, another World War One fatality, from Woodford. He was to score at least 18 goals in the season. The Bucks were not the only familiar faces missing from the attack; this was the season that Tom dropped out of first team reckoning. Contemporary reports do not carry full team line-ups; however the once frequent mentions of him become scarce with references to V.S. Rosewarne playing at outside right becoming common . Tom was still around the club though; he scored what may well have been his last first team goal in a 3-2 Isthmian League defeat to Bromley in December 1908. Despite the dramatic change in playing personnel this season was a triumph on the pitch. Dulwich won the Surrey Senior Cup for the third time and broke through on to the national football scene by reaching the F.A. Amateur Cup Semi Finals before losing 2-1 to Eston United in a match the F.A. controversially ruled must be played at Darlington. The Surrey Senior Cup Final, a 1-0 win over Metrogas at Herne Hill in front of a competition record crowd of 8000, was also notable. Cooper of Metrogas was dismissed from the field of play. This was a very rare event at the time; it is probable that this was the first time a player was dismissed in a match featuring Dulwich Hamlet. We will never know which came first, the politics or Dulwich, but it is fair to say that, in the early days, Dulwich Hamlet was a good place to be if you had right wing views and political ambitions. Pa Wilson was an influential figure locally, and an ex Conservative Councillor on Camberwell Borough Council . In 1910 the Conservative MP for Dulwich, Andrew Bonar Law stepped down from the Commons, hand picking Fred Hall as his successor. Fred appears to have been a good friend of Pa; he lived locally, and was a familiar figure at the club, being guest of honour at the 21st birthday banquet . Intriguingly Andrew Bonar Law quickly returned to Parliament and soon became a Minister, his career later peaked as Prime Minister. It is very probable he was also well known to Pa. Furthermore Dulwich itself was a strongly Conservative area, to the extent that in the 1900 General Election it returned the Conservative candidate unopposed. Pa’s political links may well have assisted the club. It could certainly help to explain why Dulwich Hamlet were always able to secure sufficient numbers of pitches, in stark contrast to Dulwich FC. Once the biggest club in the locality, they ended up moving to West London after losing their ground and folded shortly after. Intentionally or otherwise, Tom was busy moving in the right circles both in and out of work. He was a well-known freemason and a leading member of the Borough of Camberwell Masonic Lodge. Whilst we have no proof that others involved in Dulwich at the time were masons, given the backgrounds and careers of many of those present it seems highly unlikely that Tom was the only one in the club. The Masonic links saw him meet many influential figures in the area whilst his profile in local Conservative circles rose through his leading role in the foundation of the Central Unionist Club. Career-wise, by 1914 Tom was Assistant School Master at Beresford Street School in Walworth. He appears to have been genuinely popular with the boys due to his habit of joining in their games. He was a talented all round sportsman and taught the boys ‘Swedish Drill’. This was a series of exercises based on gymnastics that became very popular in Britain after the Boer War. The shocking levels of physical fitness of many working class recruits had caused an outcry, Swedish Drill was introduced to the schools to try and rectify the situation. Tom was noted for his proficiency at the drill. Ironically the drill was drifting out of fashion in the run up to World War One as it was considered both boring and ineffective. Tom’s move into local politics came in 1912 when he was selected to fight the Town Hall Ward on Camberwell Borough Council for the Municipal Reformers, an umbrella organisation backed by the Dulwich Conservative Association. The Progressives, based around The Liberal Party, held all three ward seats but were hindered by the retirement of the popular Cllr. Brenchley and the emergence of Socialist candidates also chasing the progressive vote. Three Ratepayers Association candidates completed the slate, giving it more candidates than any other ward in Camberwell. The Municipal Reform candidates gained a clean sweep; Tom came second in the ballot with 590 votes. They also tightened their grip on the council, winning 54 seats to the Progressives 16. The Municipal Reformers had been assisted by the local papers carrying an appeal for votes from the Municipal Reform leader on London County Council, Cllr. Fred Hall M.P. the old friend of both Pa and the Hamlet and consequently a man probably well known to the newly elected Councillor Rose. Camberwell Borough Council usually met at 18.30 on working days, fitting in well with Tom’s working hours at Beresford Street School. He also lived close to the Town Hall, at 3 Goschens House, Peckham Road which must also have helped him allocate sufficient time to his new duties. As well as full Council meetings he was immediately appointed to The Works & General Purposes Committee and the Libraries and Accounts Committees. He appears to have been a diligent Councillor and clearly impressed his peers as within thirteen months of being elected he was appointed Chairman of the Libraries and Museums Committee, continued to sit on the other two committees and added the Petty Cash Sub-Committee to his portfolio. 261,328 leading to concerns that the area may struggle to find suitable volunteers. Agreement was granted though, and on 3rd February war office approval was formally received. 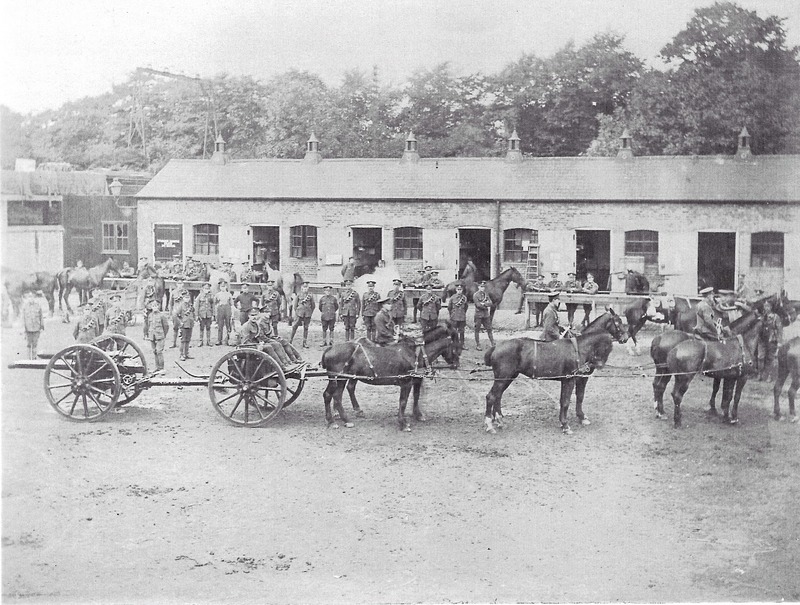 On 10th February the Council met to agree to raise a 718 strong Camberwell Gun Brigade for the Royal Field Artillery. Command of the Brigade was awarded to the familiar figure of Major Fred Hall M.P. Camberwell was very proud of the fact it was the only South London borough awarded such permission. The appearance of two such high profile recruits, both with strong links to Major Fred Hall, at a time recruiting was flagging may not be a total coincidence. Tom may also have been looking to the future. His long term political ambitions were known to lie at Westminster not Peckham Town Hall, and a spell in khaki would look good on any post war political C.V. He had made a promising start to his political career in Camberwell and, with the backing of someone as influential as Fred Hall, was well positioned to fulfil his dreams and become an M.P. in the future. Just before enlisting Tom had found himself embroiled in a political controversy when he voted for a successful motion to evict 120 Belgian refugees, 68 of them were recuperating from injuries, from Dulwich Baths, which the Council wanted to re-open to paying customers. Shortly after enlisting he found himself in the embarrassing position of being used by Progressive Councillor Lucas as an example in an attack on planned budget cuts. The cuts included the electoral registration process with Cllr. Lucas gleefully commenting that on his return Tom “may well be classified with paupers, lunatics and women – he would not be able to vote.” Tom carried on as an active Councillor until 10th March 1915, after that the Council minutes record him as absent on military duty. Headquarters. One hundred men lived there whilst the rest lived at home. It had a fully equipped gym, 6 acres for exercise, stables for the horses and a fully equipped gun park. It was around this time that the army started to make covetous glances at the Hamlet’s ground, as the growing number of recruits needed more room to train. Once again Pa’s political contacts with Major Hall were presumably invaluable as a loan deal was arranged, avoiding the ground being requisitioned. By mid March all four batteries were complete and the Ammunition Column was rapidly filling. Camberwell was the 13th Metropolitan Borough to recruit such a Brigade. As a mark of gratitude, the residents of Dulwich held a collection to present an engraved “Borough Sword” to Major Hall. Pa Wilson was amongst the first donors. So successful had the recruiting drive been that Camberwell Borough Council promptly set about filling the 167th (Camberwell) Howitzer Brigade and, when that was nearly full, the 162nd & 166th (Camberwell) Brigades Royal Field Artillery were created. In total 4,300 men or an entire Division’s artillery provision. This total was achieved on 1st June with the SLP hailing “the most remarkable Borough effort of the war” To assist in this the men already signed up had maintained a high profile. Film of them training was shown at Tower Cinema on Rye Lane. On 19th March the Council threw them a smoking concert at Camberwell Baths Halls. All the men brought a friend in a subtle recruiting drive whilst the council provided free tobacco. Marches had proved particularly useful as both recruiting weapons, and for fund raising. The first big march came on 11th April when, after an inspection at Grove Vale by General Sir Francis Lloyd the men marched to St Giles’ Camberwell. 156th were now in khaki but the Howitzer brigade were still in civilian clothing. Military figures were now a familiar sight locally with 156th still based at Grove Vale council depot, 162nd at Gordon’s Distillery in Peckham , 166th at Peckham Tram Depot and 167th at Goose Green Baths. The fate of the Lava Skating Rink on Chapel Lane, requisitioned for storage, seemingly never to re-open, shows how useful Pa’s ability to stop the army requisitioning the ground was. 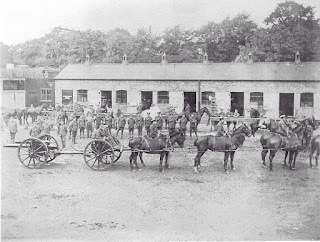 Horses tethered on the pitch, the stand being used as a tack room, the pitch used for drill exercises and carriages on the site of the old pitch, were a minor inconvenience in the long run. However, the club did complain to the army about the soldiers’ habit of smashing ginger beer bottles, bought at the adjacent tuck shop, on the pitch. July saw the pomp and ceremony peak. On 1st July 4,300 men, sixteen 18lb guns – newly received to replace three old 15lb guns and the dummy breach loaders used in training to date, and the divisional mascot, an Airedale dog , marched to St Paul’s Cathedral for a service. The guns were left outside but seemingly the dog was admitted. Many friends and family were less lucky and got locked outside due to the large crowd. Four days later saw South London witness one of the most remarkable days in its long history. 4,300 men, many mounted, and the Airedale went on a nine-mile march around South London. Locals had decorated their houses, banners were strewn across the streets and the crowds, boosted by schools giving children time off to watch events, were so large that the soldiers had trouble manoeuvring their guns through them at Camberwell Green. It took 55 minutes for the column of men to pass Peckham Town Hall, it would have taken longer if some of the men hadn’t used their new found status as local heroes to turn it into a pub crawl or dive in and out of the crowd taking proffered tobacco and sweets. Tom’s mind may have been elsewhere; on 16th June a note appears in the Council Minutes offering him condolences on the recent loss of his mother, aged 65. Her death was registered in Grimsby in the March quarter. Between the 4th and the 10th August 1915 the amount of khaki in South London declined dramatically as the men left Waterloo for Bulford , on Salisbury Plain, and live firing practice. Here they met the rest of the 33rd Division, mainly Londoners. It appears not to have suited them as the newly promoted Lieutenant-Colonel Hall was soon writing to the local press appealing for games and gramophone records stating,“I want to keep the men out of the Public-Houses”. A subsequent request appeared for Christmas cakes and puddings to be sent to the men. An inspection by the Queen was rapidly followed by ‘foreign leave’ meaning departure was imminent. Tom was certainly back in South London around late November early December as his signature appears on the minutes from a Camberwell Council meeting that occurred on 27th November. Clearly he had retained his interest in the local political scene. Orders to move finally arrived on 6th December and at 4.00 on 10th December the first of 51 trains left Amesbury for Southampton, with 40 men and 8 horses squeezed into each truck for a journey described as memorable. At 4.30 on 12th December the last train departed. On arriving at Southampton they found two transporters in the wrong berth and a third broke down forcing an entire brigade to disembark. To top it off, on arrival at Le Havre it was discovered that a mistake had been made in arranging full accommodation. One brigade was marched seven miles out of town and all the way back before finding billets. Tom himself landed on 11th December, just qualifying him for a 1914/1915 Star medal . The men had expected to go to France and not Bulford back in August, and frustration grew that they were still not in the front line. Instead they were in the quiet, slightly shabby and very muddy village of Aire undergoing further training. The mud became a big problem with men requiring more changes of socks than they had in the kit so the Mayor of Camberwell launched an appeal to buy them a new pair each, Pa Wilson was again one of the first donors with his five shillings funding five pairs of socks. The council also sent sou’westers and oilskins. In mid January the troops started being sent to the front in small batches, to observe the 2nd Divisional artillery in action. 33rd Divisional Artillery were finally deployed to the front at La Basseé on 23rd February 1915, a year and a day after Tom enlisted, replacing the 23rd Divisional Artillery. They suffered their first losses on 9th March with Bombardier J. Smith, Gunner F.C. Coley and Driver A.E. Beard killed by a shell. Lieutenant Mitchell was buried alive in the same incident but was rescued and sent home to recuperate, suffering from shock. Compared to many other sectors La Basseé was relatively quiet and a good place to blood new troops. Despite that the area was heavily mined by both sides, the detonation of a mine was inevitably followed by an infantry battle for possession of the new crater. In such battles the artillery had to hold their nerve and not add 25 yards to the length of their creeping barrage . Doing so avoided friendly fire casualties but also made it easier for the Germans to defend, as the trenches under attack by the infantry would not be under simultaneous artillery fire. Slowly the 33rd Division infantry and artillery came to respect each other. On 27th April the artillery suffered their first gas attack and the following day suffered heavy casualties when the ammunition column was shelled. This was their first really bad day and had a negative impact on morale. 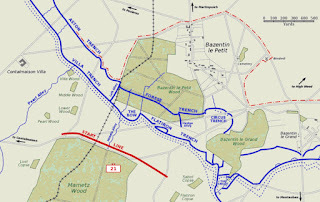 The Division had impressed the Generals though and on 18th June they were ordered to occupy the land to their right when 39th Division withdrew, leaving them holding a remarkably large sector of the Western Front. On the evening of 6/7th July it was the 33rd Division who withdrew after nearly five months in the front. During one break away from the front line Tom had written home, expressing his pleasure at being billeted in a cottage, the first time he had slept in a bed since arriving in France and saying that the pounding of the shells was now lulling him to sleep. He clearly missed his political life as he expressed his regret he was no longer actively involved, saying that he would like to pop into and observe the Council meetings. On 9th July the men took the train to the Amiens area, having been blooded at the relatively quiet La Basseé sector, they were off to hell that was The Somme. It was very hot and 156th are reported to have been half choked by dust on some of their marches, with the men happily swimming in streams and rivers to clean off and cool down. Bed for the night was invariably a bivouac. By 15th July they were at Fricourt and over the next 24 hours all the men went into the front line around Bazentin Le Grand. 14th July had seen a large Allied push here with a 3 mile land gain but some crucial targets had not fallen, including High and Delville Woods and Longueval, which 33rd Divisional Artillery were now kept busy shelling. High Wood was particularly crucial. Whilst the Germans held it they had a good view of the British troops and guns and thousands were to die here. Most batteries fired more in one day here than the entire division had fired in a day at La Basseé. 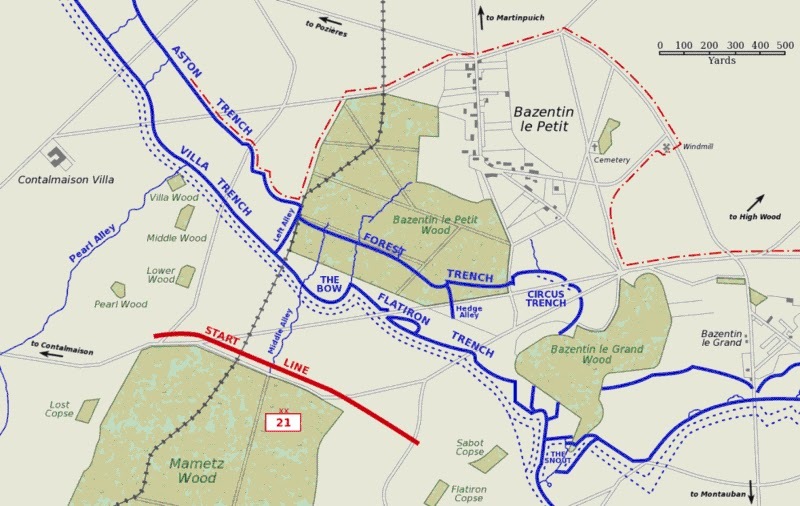 It was a tricky place to fire as shells had to skim the British lines to clear Bazentin Ridge. It was grim. Friendly fire victims were common place, the guns were becoming worn though constant use, and there was a loss of experienced artillerymen, Things were further exacerbated as the Germans exploited their possession of the high ground, with some sustained accurate shelling. On 17th July 156th C Battery were forced to withdraw. B & D Batteries decided to try and stick it out; a decision with fatal consequences for several men. It appears B Battery may have made a slight positional change at 14.00 on 19th July as Tom, by now promoted to Bombardier, was assisting positioning his gun. This was always a dangerous time as there were unlikely to be suitable slit trenches to take cover in if incoming artillery fire was sustained. That is exactly what happened and Tom received a minor shrapnel wound just below the left elbow. It is not possible to say for certain whether others were injured at the same time, however B Battery members, Driver Richard Charman (aged just 17 revealing he had given a false date of birth when enlisting) and Gunner Henry Johnson died of wounds on 23rd and 26th July respectively, suggesting they may have been injured in the same incident. B Battery had also sustained further losses prior to their deaths as Gunner John Higham and Bombardier Wilfred Doody were Killed In Action on 21st and 22nd July respectively. As walking wounded Tom reported to a Regimental Field Hospital. They had suffered heavy losses that day, with 162nd on the receiving end of a lachrymose gas attack. As a minor wound victim Tom probably had a long wait for treatment before being sent to a Casualty Clearing Station, usually by lorry. B Battery were finally forced to withdraw on the night of 20th/21st. Tom though, was now on route to Field Hospital 12 at Rouen, almost certainly by ambulance train. He wrote home on the 20th saying the wound was “not too bad” . The letter was not received until July 26th. On 24th he wrote home again saying the wound was progressing very favourably and that he would be back in England soon, probably within the week. Five days later he wrote again saying he wasn’t being allowed to travel and had to lie on his back with his arm in a cage, and had undergone two operations. This news caused his family some concern as they knew he was weak and unable to eat much. Something went badly wrong, probably an infection and on 8th August his shocked family received two letters. One was from the Matron warning them that Tom was seriously ill, the second was official confirmation that he had passed away on August 2nd aged 36. Tom was buried at Saint Sever cemetery in Rouen, his coffin was adorned by white flowers sent by a female visitor to the ward he had been under treatment in. A subsequent letter by the Matron to his family said that he passed away at 3 a.m. from “weakness following on hemorrhage” and had been conscious to the end. To put Tom’s death into context, on that one day alone the British army lost another 282 ‘Other Ranks’ and 24 Officers whilst the Royal Artillery lost a total of 49,076 men during World War One. Camberwell Council met the very day Tom died, as normal the minutes listed him as absent on military service. Clearly news of his wound had already reached South London as Councilor Shrimpton asked whether there was any news that Tom had been wounded. “Not officially.” was the reply. Official confirmation of his death came in the form of a letter from Fred Rose, now residing in Cleethorpes, dated 11th August and Tom’s demise was formally noted in the Council minutes on 20th September, along with news that Councilor Lt-Col Robert Dunsmore was in hospital suffering from shell shock . After a Council vote on 18th October John Ogden, a grocer & provisions merchant of 156 Southampton Street was co-opted onto the Council to replace Cllr. Rose, winning by 23 votes to 10 over Mrs E. Morris of 23 Eynella Road. Formal elections were not held until 1919, when the changing political landscape locally saw the Labour Party gain all three seats in the Town Hall ward. Original article from HH15 Spring 2006. Each week for over a year the presenters have been chatting about different aspects of South London. One week they might concentrate on Peckham, Brixton or Greenwich, another they might be looking at the South London Comic Festival or the way Thamesmead features in the movie A Clockwork Orange. They have produced shows as wide ranging as the sitcoms set in South London, the best footballers to have graced our stadiums, music videos made in our streets, interviews with their transpontine friends including illustrator, graphic novelist and architect Owen Pomery. The latest show features interviews with Mishi Morath and the folks behind Tales From The Pigeon Stands as well as other bloggers, tweeters and one of the fans' favourite players at Champion Hill, Erhun Oztumer. This particular episode is a bumper one and times in at a hundred minutes. My apologies, but I do go on. It is with much sadness that we report the death of John 'Ginger' Gornall who passed away on January 7th, 2013. John was a Hamlet player in the 1940's and 50's, playing on the right wing in the same side as Tommy Jover and Claude Whitworth. He played in the famous match against the barefooted Nigerian touring side in 1949, and was a member of the team that won the London Senior Cup at Highbury later in the same season. Movie footage of the Nigeria match can be seen by clicking here. He was also a prominent figure in the Dulwich Hamlet Cricket Club as an opening batsman. In one amazing eight day spell he scored four centuries in successive matches and also managed to get a game of football in as well. 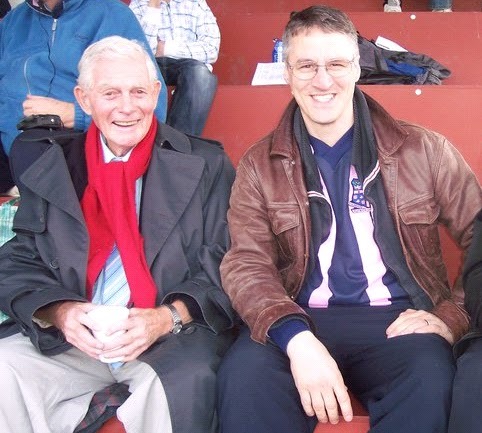 A very amiable gentleman, John was a member of the DHFC Vice Presidents Club and made regular visits to Champion Hill to enjoy time with his old team mates and to watch the football. The Hamlet Historian sends its sincere condolences to the Gornall family.